I have found in my life that there are similar habits with Excess Clutter and Excess Weight. This doesn't apply to everyone, but you may consider if any of these ring a bell for you. 1. When you are bombarded with so much advertising and so many things to buy, it is sometimes hard to find a balance and only buy what you need. I find the same thing true when I go to an "All You Can Eat Buffet." It is hard to just eat a regular portion when there are so many different things to try. 2. People have buyer's remorse when they buy things they really don't need or can't afford. People also have remorse when they eat too much. 3. It is easy to buy too many things that you don't need when you get them at a discounted price. It is also easy to eat too much when you can get a great deal going out to eat: chips that keep getting refilled as much as you want, unlimited bread sticks or bottomless fries. 4. You will be happier and have an easier time cleaning your home if you own what you need and don't have a lot of extra clutter around. You won't feel as much of the emotional burden and stress that extra clutter brings. When you are at a healthy weight, you feel better about yourself. You avoid those shopping trips where you don't want to get any clothes because you don't feel like you look good in anything. 5. Just because you can afford to buy what you want, doesn't mean that you should. You just don't need that much stuff, even if you can afford it. Just because you can afford to go out to eat or buy a lot of food, doesn't mean that you should. 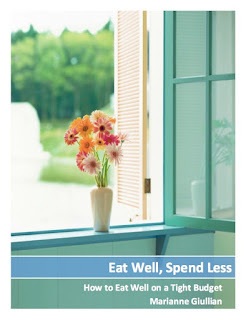 It isn't good for you to eat that much, even if you can afford to do so. 6. You don't need to buy something just because it is on sale. If you don't use it or need it, you shouldn't buy it even if it is cheap. You don't need to buy cheap food just because it is on sale or you have coupons that make it dirt cheap or free. Those processed foods aren't good for you, regardless of the price. 7. Sometimes we buy stuff as a way to comfort ourselves. Sometimes we eat foods as a way to comfort ourselves. It is better to find a different way of comfort like going on a walk or talking to a friend. 8. If we buy too much, we have to work harder to keep our homes clean. This can lead to depression in some cases. If we eat too much, our bodies have to work harder to process all the food. This can lead to cancer or other diseases in some cases. 9. Sometimes people forget their manners when it comes to fighting over the great deals. Remember the woman who sprayed someone with pepper spray over something she wanted? Remember the woman who got trampled on as people hurried to get the best deals in Walmart one Black Friday? Sometimes people are rude about food. They want to be first in line or eat the biggest piece or don't leave enough for others. 10. When we reward our kids with stuff, they attach love to things. When we reward our kids with food, they attach love to food. What habits do we want to pass on to our kids? By limiting our things and the food we eat to a proper portion or balance, we will feel better about ourselves and have more physical and emotional energy to deal with our daily responsibilities without feeling too overwhelmed. If we save the extra money we have from shopping more wisely and eating more wisely, we will have money available for when we really do need it. We can also save it for the future so we have a more comfortable retirement.